With more and more people owning internet-enabled smartphones, poker players looking for a way to get a game in while on the go will be happy to know that there are a variety of options. The mobile gaming market is on the brink of a boom and most of the big poker rooms are scrambling to offer their customers the chance to play poker on iPads, iPhones and every other type of mobile device out there. Apple has the biggest chunk of the market share and that’s where the poker companies are looking first. Does iPad Support Real Money Poker? There is some confusion over whether you can play poker on iPad or not. If you go to the App Store, you’ll see lots and lots of poker apps for you download and play on. All of these apps allow you to play against other iPad and iPhone players, but most of them are based on play money games. Apple has quite strict regulations about having gambling products and the App Store, but they are slowly easing them as they become aware of the revenue that poker products can generate, and the fact that it is a skill-based game at heart. A few of the real money poker rooms have gotten around these regulations by designing in-browser poker applets that allow you to play real money poker on the iPad using the built in browser, Safari. 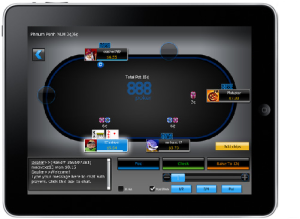 So far, 888 Poker, PKR and Winamax are the biggest iPad friendly poker rooms but over the coming months we expect more and more rooms to come online, as the likes of Party Poker and Pokerstars’ iPad apps are in the final stages of testing. There are a few differences between playing on your iPad and you desktop or laptop. The first of these is that on the iPad you’ll typically only be able to play one table. A lot of people like to play multiple tables to get as much action as is possible, but early indications are that most sites will only have the option to play one table, at least in their early offerings. This will suit most people however, who just want to pass the time and play a few hands if they’re stuck in the airport or on the train. The second point is that if you’re playing poker on a mobile device, you’ll often be playing on a 3G connection. If you’re playing for real money, you need to ensure that you’re in an area where the connection is reliable and should check the disconnection policy of the site you’re playing on, to make sure you’re not left out of pocket if you do encounter a problem. Lastly of course, you should practice a little on the play moneys tables first as playing poker on a touch screen device can take a little getting used to. The last thing you want to do is tap the ‘all-in’ button when you meant to tap the ‘fold’ button! To date, most real money poker software for iPad and iPhone are identical due to the fact that most of them run in the Safari browser. Similarly, the few providers who have apps in the App Store are running the same ones for the iPad and the iPhone. It’s possible that in the future as the market grows that companies will release separate apps for the two platforms, but as things stand they’re happy to offer the same service to both iPad on iPhone customers. One benefit of playing on the iPad of course is the bigger screen, meaning it’s easier to follow the action and you have less chance of making a ‘misclick’! 888 Poker has extended their mobile offering, now compatible on all Windows, Android and Apple products. When playing on your mobile device you will be pooled with players on the 888 network, unlink other mobile platforms which look to segregate mobile and computer users. Playing at 888 on your iPad is very easy. Simply go to www.888poker.com and follow the instructions on your screen. Current game offerings on the 888 app are cash games and Sit & Go’s. PokerStars is the world’s biggest poker site and the mobile gaming community is excited about their iPad poker offering, however one must remember that it is PokerStars. PokerStars became the biggest poker website by consistently offering the best features to their customers. This in turn has brought the best players to their site. So, while we recommend playing at PokerStars, we feel it is too hard to make money there.